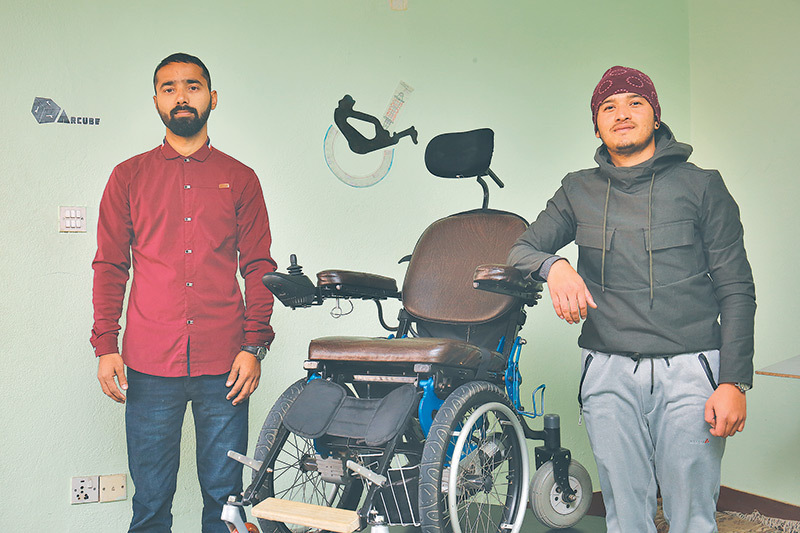 Young Nepali entrepreneurs have built an electric wheelchair that could potentially revolutionise differently abled lives, but how would it fare on Kathmandu’s chaotic streets? Jan 6, 2018-In September, many bystanders had a curious look on their faces as Sunil Pariyar—one of the young co-founders of Infinity Lab—successfully test drove an electronic wheelchair from Shantinagar in Baneshwor to Patan Dhoka. Powered by a rechargeable battery, the wheelchair is the first of its kind that has been designed and produced using mostly locally available materials. Called the ‘Leopard’, the wheelchair allows its users to travel at a top speed of 10 kilometres per hour and can cover up to 25 kilometres, after being fully charged for three hours. The developers, at Infinity Lab, further claim that they can supply the electric wheelchair for Rs 300,000. And as imported wheelchairs often quickly run out of service because there are no proper maintenance services available in the country, a locally made electric wheelchair can be a huge boon for the estimated 200,000 differently abled people in Nepal. As soon as they began, however, the novice entrepreneurs realised that they had no lab, equipment, trained labourers or money to start their venture. But they found a few helping hands along the way to help them develop a prototype. Kathmandu University provided the team with a lab and Independent Living Centre, Kathmandu (CIL-Kathmandu), a non-profit that focuses on the promotion and protection of the rights of Persons With Disabilities (PWDs) provided the necessary financial backing for the project. Then after more than two years of continuous labour, several technical failures and constant support from the non-profit, Infinity Lab finally developed a prototype last February. Leopard is controlled by a simple joystick, which allows for easy navigation. It is designed to house medicines, water bottles, and a urine pouch that is attached underneath the seat. The wheelchair also comes with a GPS system that the kin can use to keep track of the current location of the user. Despite the huge leaps made by the innovators, the prototype still hasn’t been developed to its full potential yet. It, for instance, is still not equipped with side view mirrors that are used in motorcycles or scooters to ensure the safety of the rider; according to Neupane their team is working to fix the problem by adding reflectors, which will enhance the safety of the user. Also, the wheelchair is only as tall as an office chair. It raises the questions of if the wheelchair is a safe for use in Kathmandu’s chaotic traffic. But the major hurdle, according to the founders of Infinity Lab, lies elsewhere. At the inauguration of the prototype, Finance State Minister Uday Shamsher Rana promised to help Infinity Lab by discussing the possibility of waiving the custom fees for batteries and other materials necessary for the assembling of the wheelchair. A subsidy from the government would reduce the cost of production by an estimated Rs 50,000. With the subsidy, Infinity Lab might be able to introduce Leopard to the streets, but whether they radically change the lives of differently-abled people is yet to be seen. The team at Infinity Lab is confident that it will find a way to bring the product to the market, and their product might make a difference. However, they recognise that it must also be coupled with a national-level dialogue on how buildings and streets in the country can be made more accessible for the differently abled.